Certified STI instructor, Dr. Laura Lynn. Since Time Immemorial (STI) is a curriculum created to educate Washington State elementary through high school students on the history, culture, traditions and sovereignty of the Northwest coastal tribes. The school districts will meet frequently with local tribes so their students can learn first-hand about the resilient people of Native America and the unfortunate journey we have experienced since Christopher Columbus ‘discovered’ the new world. In the early 2000’s, Tulalip tribal member and Washington State Senator, John McCoy wrote House Bill 1495 that encouraged Washington school districts to teach students about local tribes. Since the bill was passed less than 30% of the school districts participated in teaching the history of neighboring Native communities. In 2014, Senator McCoy presented a new bill, Senate Bill 5433. House Bill 1495 and Senate Bill 5433 were essentially the same, however, the slight alteration of verbiage changed Native American education from being encouraged to a requirement. During the time period between the two bills, STI was created and made available for the schools that chose to participate. Since then the creators have been able to fine-tune the curriculum by trial and error of participating school districts. The end result is a free, easy accessible curriculum that includes full lesson plans, videos, reading material, and activities that will potentially put an end to stereotypes and misconceptions of Native People that many non-natives possess. Certified STI instructor, Dr. Laura Lynn, recently spoke to educators, administrators, and parents from the nearby school districts of Edmonds, Mukilteo, Monroe and Arlington at the Hibulb Cultural Center to discuss the background, and to present an in-depth view of the curriculum. 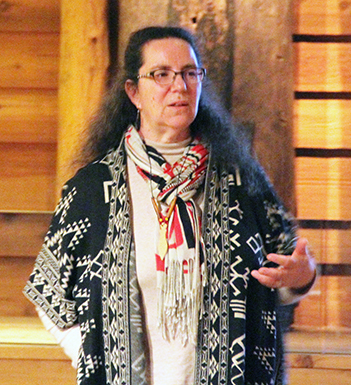 Dr. Lynn expressed that the youth need to understand the true history of local tribes. She explained that America often tries to downplay the tragedies that occurred to Natives and make it feel like it took place a long time ago. When in reality the elders of today’s tribes were taken from their families and placed into boarding schools where they were forced to learn the white culture and lose their traditional cultural teachings. The event concluded with a story, exclusively for the educators, by Master Carver/Storyteller Kenny Moses. As more schools are starting to implement the STI curriculum, the hope of a better tomorrow emerges. An opportunity for a future without harmful stereotypes and offensive mascots is presented. Coast Salish tribes will finally get to share our similar yet unique story as Native Peoples. This entry was posted in Education, News, Tulalip News and tagged education, Native American, schools, Since Time Immemorial, STI by Kim Kalliber. Bookmark the permalink.